Expect lifetime: over 100,000 hours.. Size: W 25" x H 19" X D 1.5"
Scarface is a 1983 American crime drama film directed by Brian De Palma and written by Oliver Stone. A remake of the 1932 film of the same name, Scarface tells the story of Cuban refugee Tony Montana (Al Pacino) who arrives in 1980s Miami with nothing, and rises to become a powerful drug kingpin. The film also features Mary Elizabeth Mastrantonio, Steven Bauer, and Michelle Pfeiffer. 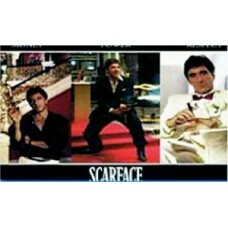 The initial critical response to Scarface was mixed, with criticism over excessive violence, frequent strong language and graphic hard drug usage.